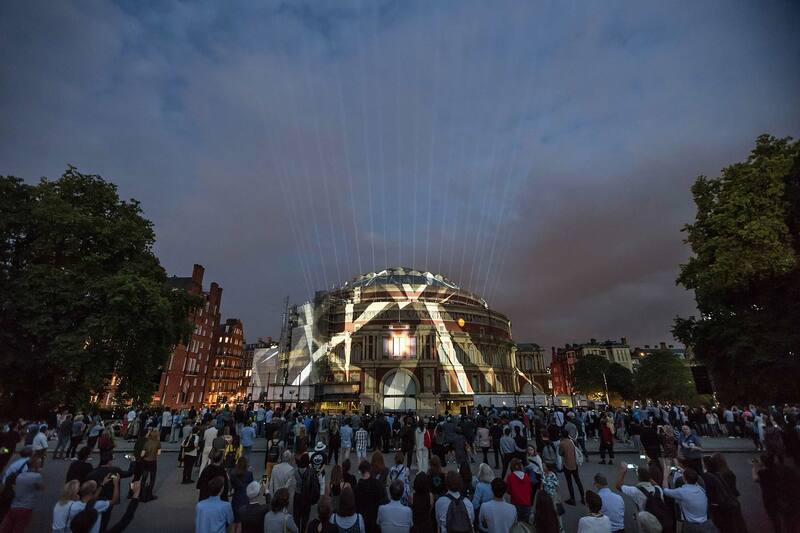 BBC’s signature First Night of the Proms recently took place at the Royal Albert Hall, opening with the world premiere of Five Telegrams by Anna Meredith and 59 Productions. This was commissioned by BBC Proms, Edinburgh International Festival and 14-18 NOW, the UK’s arts programme for the First World War centenary, in collaboration with the Royal Albert Hall. The First Night of the Proms was preceded by the Proms Free Curtain Raiser, a BBC Proms first that gave 5,000 people the opportunity to witness the Royal Albert Hall as it has never been seen before as 59 Productions’ extraordinary visuals were projected-mapped onto the external façade of the building whilst a brand new score by composer Anna Meredith was transmitted live from within the Hall. Following its previous work on similar projects, White Light was approached to the provide the production support. For WL, the project was overseen by Senior Account Manager Dominic Yates. Dominic comments: “We were contracted by the BBC and worked in conjunction with 59 Productions, who we have previously collaborated with on the Guggenheim 20th Anniversary event in Bilbao along with the recent Barbican Tunnel project so have a great working relationship. During the pre-production stages, I worked closely with both 59 and the BBC in order to create something unforgettable which celebrated the opening of such an important occasion. The idea was to completely transform the exterior of the Royal Albert Hall through the use of lighting, projection and sound”. James Roxburgh, Production Manager at 59 Productions, comments: “Five Telegrams is an ambitious collaboration between Anna Meredith and 59 Productions, commissioned by the BBC, Edinburgh International Festival and 14-18NOW. We presented it for the first time on the exterior of the Royal Albert Hall, then inside the Royal Albert Hall on two consecutive nights to open the BBC Proms 2018 season. We wanted to make sure as many different audiences got to see it as possible in person, broadcast and online. The big challenge was to load in the full site infrastructure, projector towers and video system in a single day, so I needed a trusted and experienced team to deliver the project on such an important site, in the Royal Park adjacent to the Albert Memorial. WL was my first choice as we had such productive collaborations in the past. 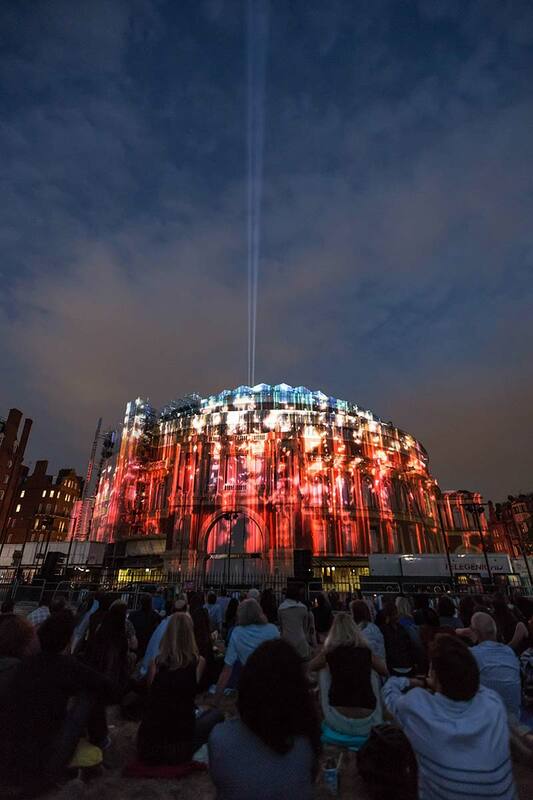 Delivering a projection-mapping event with a live Symphony Orchestra, with only one show, is a high-risk project, so required special technical considerations throughout design and planning; something we knew WL could offer”. For the evening, WL supplied a range of technical services. Dominic explains: “One of our main roles was to supply the lighting, which was predominately Aqua Beams and Strobes on the Albert Hall roof. We also supplied rigging across the entire site, which included two custom designed projection and PA towers”. Alongside this, WL supplied site lighting across the whole site, mains distribution and generators and production site services including Portacabins, furniture, access equipment and forklifts. WL’s on-site team of 14 technicians were led by Senior Project Manager Martin Strods. The video equipment was supplied by Blue-i Theatre Technology and the audio by Delta Live. Dominic adds: “With an audience of 5,000 in attendance and millions watching across the globe, we knew we had to deliver something spectacular. By drawing on our previous experience, coupled with our expert teams alongside us, we were able to create an unforgettable First Night of the Proms – something we’re extremely proud of”. James comments: “Despite being a very time tight on site, the load in and load out were very smoothly managed. We hit every one of our critical deadlines, and the teams from BBC, Royal Parks and Westminster Council were complimentary of all of the site work completed. The event itself was the first time the Royal Albert Hall has been transformed in this way, and we were all thrilled with the result. The real pleasure for me was to be able to keep the creative team focused on making the show better, and to be able to trust the team from WL who were dealing with all of the practical production requirements on our behalf”. Following the First Night of the Proms, Five Telegrams will also open the Edinburgh International Festival this evening at 10:30pm in Festival Square, sponsored by Aberdeen Standard Investments. 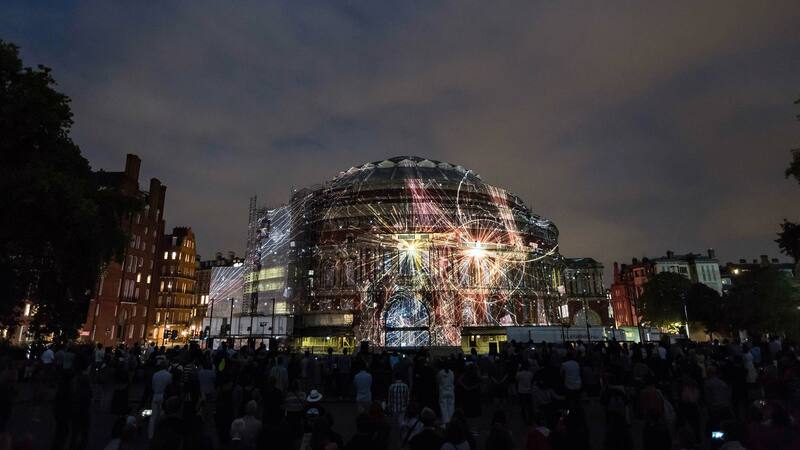 Five Telegrams is commissioned by BBC Proms, Edinburgh International Festival and 14-18 NOW. Five Telegrams by Anna Meredith and 59 Productions opens the BBC Proms 2018. Commissioned by BBC Proms, Edinburgh International Festival and 14-18 NOW, in collaboration with the Royal Albert Hall. Photo by Justin Sutcliffe.